WOW Let me just say this... I used Dunkin Hines Flavor Packets ( Bubble Gum).. It is really good Taste just like Bazooka gum and the pink color is perfect..I cant wait to try all the others..Just had to share this with you all. 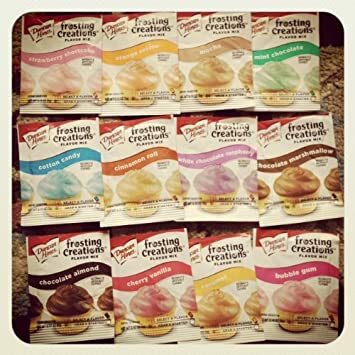 I've been wondering if those flavor packets would be good to add to homemade frosting. I don't care for bubble gum but some of the other flavors sound interesting. I have got to get me a Duncan Hines mix! So expensive over here though. We have Duncan Hines here in Canada where I live, but can't honestly say I have ever seen a "flavor packet". But then again, never really looked. Could be just in the States. I've purchased the caramel and used a little dissolved in water to flavor MMF. It tasted pretty good. June, here they are next to the frosting cans because they are supposed to be used to flavor the frosting. I found them by accident. I don't think I have ever bought canned icing. I usually go food shopping on Monday and they are usually restocking the shelves where I go. That aisle was very crowded as a result and I needed to buy flour so I to "pull over" in order for someone to go by and it was right next to them. I'm not too crazy about artificial flavors but figured what the heck and bought one.